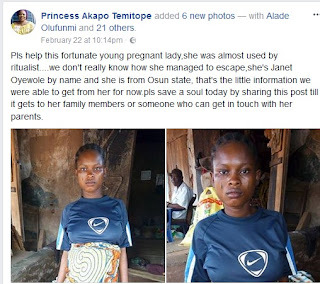 An appeal is being made online to help locate the family of a young pregnant woman who was almost used by suspected ritualists. According to an online report, the woman identified as Janet Oyewole from Osun state managed to escape from her alleged captors and is said to have lost her memory in the process. She revealed that a car dropped her at a roundabout in Ado Odo area of Ogun state. The lady who claimed she can’t remember much – is hoping to reunite with her family. 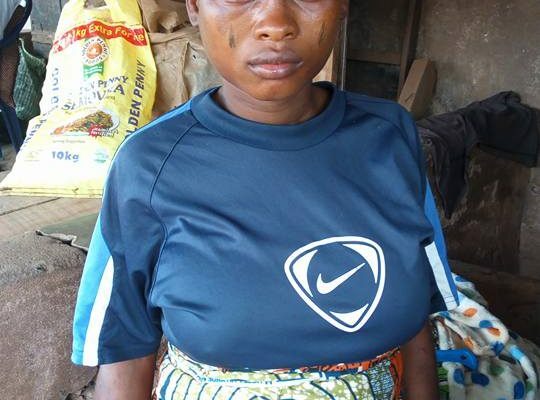 Pls help this fortunate young pregnant lady,she was almost used by ritualist….we don’t really know how she managed to escape,she’s Janet Oyewole by name and she is from Osun state, that’s the little information we were able to get from her for now.pls save a soul today by sharing this post till it gets to her family members or someone who can get in touch with her parents.